The Odds Are Good That Online Gambling Will Continue to Thrive — But at What Price? Online poker is on a winning streak. According to research firm River City Group, Internet poker alone is a $2 billion-a-year industry with a million players monthly. ComScore Media Metrix — which measures all U.S. Internet users at home, work and college locations — reports more than 29.1 million unique visitors to online gambling sites in April, out of a total audience of 165 million. And, according to a recent survey from The University of Pennsylvania’s Annenberg Public Policy Center, card playing for money has increased among males between the ages of 14 and 22. In 2004, 11.4% of in-school male youth reported betting on cards at least once a week, up from 6.2% in 2003; furthermore, 11.4% of these weekly card players are likely to gamble on the Internet. In addition, 43.2% of players who bet money weekly on cards were under 18, according to the Annenberg survey. Observers agree that the numbers are impressive — at least for the leaders. “It’s a big business, widely distributed and badly regulated,” says Wharton legal studies professor Dan Hunter. Indeed, the proliferation of online gambling operators such as the Gibraltar-based PartyGaming has opened a host of public policy, legal and e-commerce debates: What is legal? Do current laws on the books have any impact on Internet gambling? Can U.S. authorities realistically cut off Internet sites that operate offshore? Is it up to states to legalize online gambling? “There’s a lot of concern about whether this is legal, especially when it’s a form of gambling that’s accessible to adolescents,” says Daniel Romer, research director of Annenberg’s Adolescent Risk Communications Institute. He notes that casinos are limited to people over 21 years of age, and lottery tickets are sold to those 18 and older. While some online gambling sites check age, underage players can simply bluff about their real birth dates. It all adds up to a growing gambling paradox in the U.S., where policymakers are trying to put the kibosh on online gambling sites even as games of chance are a part of daily life. Lottery tickets are sold in vending machines, and states looking to boost revenue are launching casinos at a rapid clip. Poker-game broadcasts abound on cable television: “Celebrity Poker Showdown,” “Poker Superstars Invitational Tournaments,” “National Heads-Up Poker Championship,” “Ultimate Poker Challenge” and “World Poker Tour” are just a few. Toss in games found online, and poker itself could become a 24-hour obsession with the potential to lead to other forms of gambling. In the short-term, the predominant public policy response to online gambling is to target major site operators and make examples of them with stiff penalties. Should the U.S. launch stings designed to shut down the sites when agencies like the Federal Bureau of Investigation don’t have jurisdiction? Should these online gambling sites be allowed in the U.S., but be regulated and taxed? The United Kingdom recently took such a step. “In the U.K., the theory is to regulate [online gambling] to prevent underage players,” says Romer. Keith Whyte, executive director for the National Council on Problem Gambling, notes that legality and enforcement are two different things. “You can say online gambling is illegal, but if you can’t enforce [the law] it doesn’t matter,” he says. Romer says the main solution may be just to make online gambling legal, regulate it and put safeguards in place. However, that’s easier said than done. Typically, gambling is a state issue and jurisdiction is unclear. In addition, several interests are at stake. States, which are increasingly reliant on gambling revenue from casinos and horse racing tracks, won’t be happy about online competition. Ultimately, online courts and legislatures in the U.S. will dictate online gambling policy. Last year, CasinoCity.com sued the Justice Department over taking advertising from online gambling sites offshore. In April, the World Trade Organization ruled in favor of Antigua over a 2003 complaint about the U.S.’s “total prohibition” of cross-border third party gambling services. The federal government forbids using wire communications to place bets, a law that may impact online gambling. Meanwhile, North Dakota floated a bill to make online gambling legal only to see it defeated in the state senate. According to Werbach, the only real hurdle is trust. 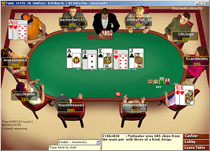 “Users must be convinced they aren’t being cheated; it’s harder to offer that confidence when the players don’t see each other face to face,” he notes. The social aspects of online gambling coincide with an effective marketing strategy. Sernovitz says successful word-of-mouth marketing consists of finding influencers in a group, giving them something to talk about, making the message easy to pass along and then tracking results. The popularity of poker was stoked by the massive exposure to the game by television, says Sernovitz. Word of mouth took it from there. In the case of online poker, these messages can move seamlessly through emails, weblogs, conversation and instant messaging. While online casinos may not be an initial threat to their real-world counterparts, the Internet is likely to force changes. “Just as Amazon.com forced physical-world bookstores to focus on the customer’s experience, online gambling will force casinos to emphasize the unique aspects of what they do,” says Werbach. That fact may make it harder for other cities and states to explore gambling as a revenue source, adds Rybczynski. “It’s no longer simply a question of lining up slot machines on the floor and providing a tired floor show,” he says. To be sure, the battle is just beginning. Assuming the U.S. legalized online gaming, some traditional casinos might eventually decide to claim their own space on the Internet. “These casinos have brands to protect, and I bet that would translate online,” says Whyte.